In the last year, the fashion industry took more and more steps toward inclusivity; female empowerment; and putting a stop to retouching, body-shaming and discrimination. While the industry is still far from perfect, there are a few brands that walk the walk when it comes to being inclusive in every way. Praise to brands such as Aerie for not retouching bodies and using models of every shape, size and color; brands such as eShakti for providing completely customizable clothing to fit your body perfectly; and finally brands such as ModCloth, Asos and Swimsuits for All that provide clothing from straight through plus-size. Below we are outlining 13 brands that have shaken things up in the industry and started paving the way toward more body-positive branding. Meet your completely customizable retailer, eShakti, aka your new best friend. The brand offers sizes from 0 through 36W and complete customization through exact body measurements, various options for necklines and sleeves and garment length to fit your height. Talk about a new way to shop without breaking the bank. Aerie stopped retouching its photos a couple of years ago and started being more inclusive with diverse models and sizing. We love that the brand embraces stretch lines, cellulite and real bodies. Get your booty in here! ALL undies 10 for $35 this weekend, and yes, that means our amazing-super-soft-second-skin Real Me Thongs & Boybriefs, too. ModCloth is your perfect mix of feminine, vintage and quirky. There’s something for everyone, and the company offers garments in straight to plus-size. What’s even better, it actually shows pictures of two models (straight and plus-size) to see what both look like in the garment. Can we get a round of applause, please? Snow cats, party cats, fancy cats 🐱❄️🎉🎩 Get your paws on the perfect gift for the cat lady in your life. Not a cat person? We've got gifts for all animal lovers and more in the 2017 Holiday Gift Guide. // Shop via link in bio. We can’t help but spend hours online shopping on Asos and calling it our one-stop shop because the site literally has everything and more. It offers various sizing — straight, curvy and plus as well as maternity, tall and petite styles. This is you season, Ally. Keep shinin' in vinyl this autumn. Old Navy is one of our classic favorites. It has great prices, tons of stylish options and sizing for all. It also makes sure its advertisements, social media and models are diverse, and the brand promotes body-positivity. We dare you to scroll through Swimsuits for All’s Instagram account and not feel empowered or more confident or want to immediately throw on a bikini and head to the beach. This is a brand that has definitely walked the walk and talked the talk, and we believe it fosters an interactive and engaged community with its customers and promotes loving your body, whether you’re a size 4 or 34. Eloquii is one of our favorite plus-size brands. 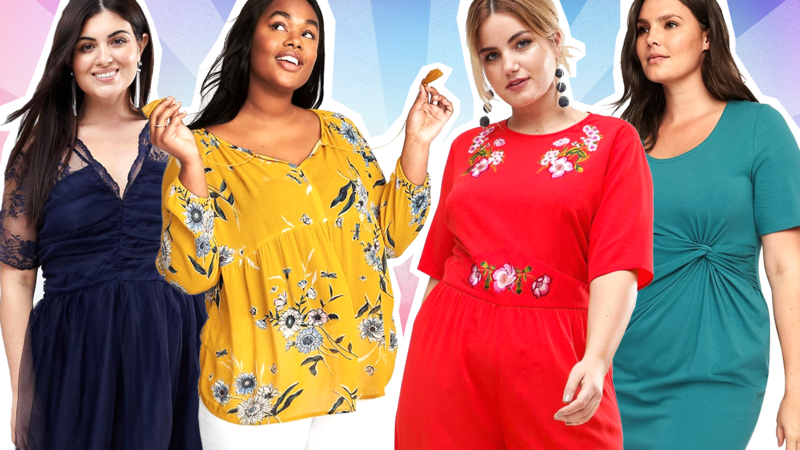 It offers sizes 14 through 28 and focuses on “fashion for the style-driven, fit-obsessed customer.” Eloquii designs fun, trend-forward pieces with great structure and affordable prices. Dear Kate is a “fear-proof, worry-free undies and apparel” company that helps you get through any period, literally. Its branding is relatable, chill and girl-power-positive. Who else could spend hours wandering through the aisles of Target and feel right at home? Target offers a wide selection of in-house brands, sizing and plenty of options for every personal style. We love how the store promotes body-positivity, real women and attainable style. Dressbarn offers clothing sizes 2 to 24 and does a great job on social media showing pictures of its db brand ambassadors, who are real women wearing Dressbarn. It has created a great community for the brand and shows how women all over style the pieces on their own.